Symptomatology of brain tumors is very vague and dramatic. Benign and some malignant primary tumors have gradual onset and progressive course while highly malignant tumors and metastasis presents abruptly and patient deteriorates very rapidly. Most of the symptoms are due to pressure effect of the tumor itself and presents as symptoms of raised intracranial tension. Important symptoms of brain tumors are summarized below. Headache- Although it is not specific for tumors but it is one of the most common symptom. It may be localized or generalized, mild to severe in severity and diurnal variation. The longstanding headache should be evaluated for brain tumors. Vomiting- It is also due to raised ICT, usually associated with headache. Projectile non bilious vomiting with relief in headache after vomiting indicates raised ICT. Change in consciousness- This is usually late symptom. But it may be presenting symptom in malignant or secondary brain tumors. 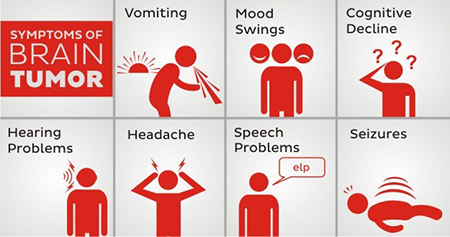 Seizures- Nonspecific but might be presenting symptom. Usually present in supratentorial tumors. Focal seizures are more indicative than generalized seizures. Present in about 20% of patients of tumors. Thus the symptoms are too vague to diagnose the brain tumors only on the basis of symptoms. But these symptoms must trigger a clinician to look for any mass lesion in brain. Diagnosis is made mainly by imaging (CT scan, MRI). Advent of MR spectroscopy helps a lot in differentiating benign and malignant tumors, infarcts, infection and other mass lesions. For common or new onset headaches a simple investigation would be CT scan. However, most doctors will advise MRI as the first form of diagnosis as it gives better definition of intracranial structures as compared to MRI. 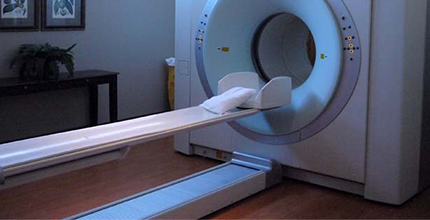 Another advantage of MRI is that it does not give radiation and hence suitable for most patients. MRI is now available in most cities of India and hence should be performed if there is any suspicion of neurological disorder. With advanced MRI machines, one can do a lot more like functional imaging to map various areas of brain, diffuse tensor imaging to image various fiber tracts of brain spectroscopy to know the nature of the tumor perfusion scan to know the blood supply of the tumor etc.